Here are my ten favorite charts of 2017. They’re in no particular order. Some are here because they represent something important, and some are just interesting tidbits. But they’re all things that are worth knowing. Yes, it was James Comey who was responsible for putting Donald Trump in the White House. The whole, overwhelming case is here if you feel like reliving your worst nightmare once again. Statues of Confederate leaders weren’t put up to commemorate the war dead. They were put up decades later as part of a campaign to prop up Jim Crow and white supremacy. I don’t think anybody would say that the US response to the Great Recession was ideal. The stimulus was too small, homeowners were ill treated, bankers got off scot-free, and middle-class household wealth plummeted. That said, we probably handled it better than anyone else, thanks mostly to Nancy Pelosi, Barack Obama, and Ben Bernanke. Remember that. It’s possible to run a real-world test of what happens when you adopt full-bore conservative economic principles, and Kansas did it. After electing right-wing zealot Sam Brownback governor, taxes on the rich went down; taxes on the middle class went up; and spending on social programs plummeted. “Our new pro-growth tax policy will be like a shot of adrenaline into the heart of the Kansas economy,” he said. It turned out to be more like a shot of cyanide. #5. Wind and solar power. The true, long-term cost of wind and solar power has finally gotten to the point where it’s competitive with fossil fuels. 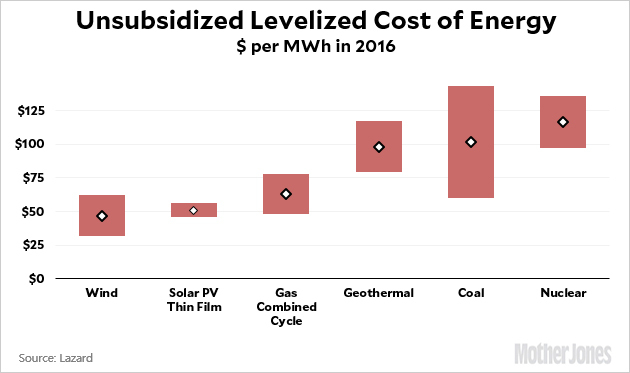 In some areas it’s even cheaper, and for solar in particular the cost is going to keep coming down. To a certain extent, this means that Donald Trump’s plan to repeal Obama-era carbon regulations matters less than he thinks, since fossil-based power sources are rapidly becoming too expensive to bother with. This is already true of coal, and will probably be true of oil and gas before long too. In ten years, all newly built power plants will likely be based on renewable sources purely because they make the most economic sense. If we were smart, though, we’d use public policy to hasten that day. When male surgeons unexpectedly lose a patient on the operating table, they suffer few consequences from their peers. After all, it’s one of those things that happens sometimes when you’re in a risky business. But when female surgeons lose a patient, primary care doctors take it as a reflection on their competence and reduce their referrals. 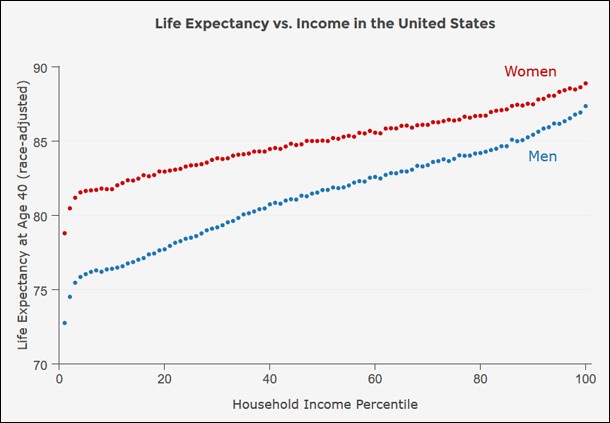 In America, the rich live more than ten years longer than the poor. Keep this in mind the next time someone suggests that we should raise the Social Security retirement age. For the poorest Americans, it would mean they’d receive Social Security payments for only about six or seven years before they died. But the rich would barely notice it. #8. Income by age group. Over the past 40 years, the demographic group that has experienced the slowest income group is young adults. The elderly have seen the fastest income growth. It’s long past time that we focus a little less on seniors and a little more on why the young and middle-aged have done so poorly for four consecutive decades. #10. White votes for Donald Trump. Donald Trump won a lower share of the white vote than Mitt Romney did in 2012. This was true not just nationwide, but in most towns and cities within the top 50 metro areas. 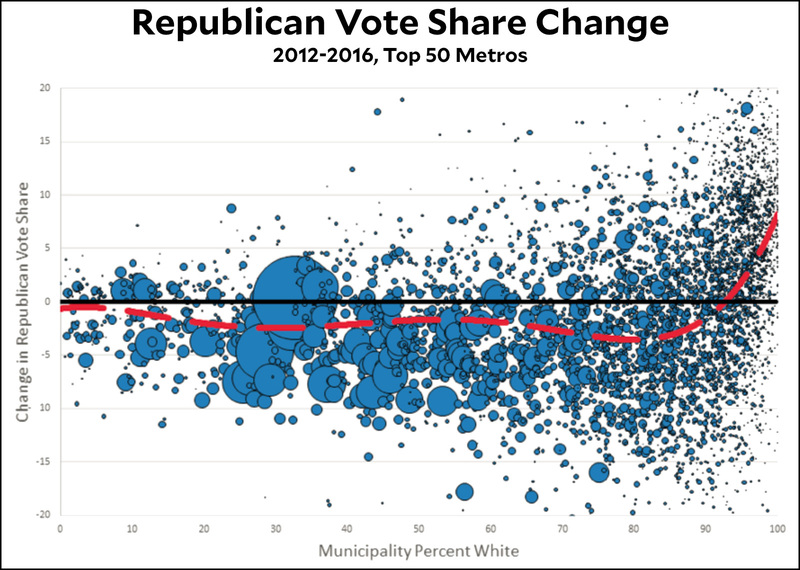 But there’s one place where Trump did really well with whites: in communities that are more than 90 percent white. As with so many other things, fear of minorities decreases when people see minorities on a regular basis. It’s in places where they aren’t visible that white fear can be most easily stoked by outfits like Fox News and demagogues like Trump. These should be at the top of everyone’s mind all the time, every year. The first is CO2 emissions. 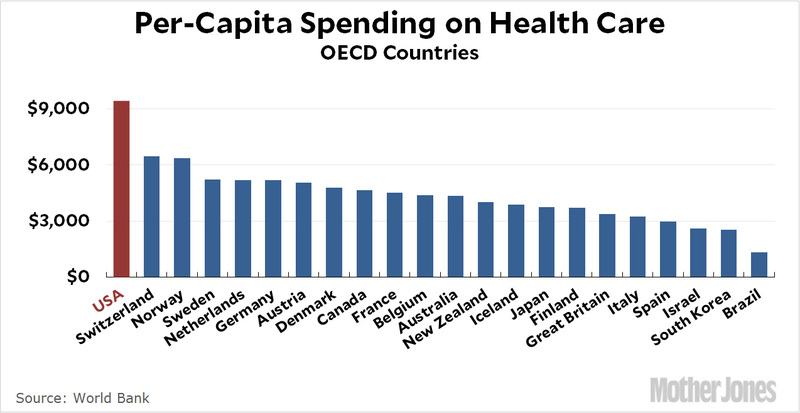 The second is America’s astronomical cost of health care.